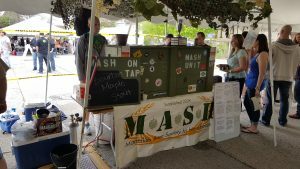 Come Celebrate National Homebrewers Day with us! Now in its fifth year , the MASH UP Homebrew Festival is a friendly gathering of Homebrewers sharing their beer with you! Admission gets you samples of the best homebrewed beers our competitors have put on the line. Judges will pick the Best Brew and the Mayors Choice, while you – the people – will get to vote on People’s Choice. Come try over 50 different brews from clubs all across Illinois! If you have a club and want to join in on the fun give us a call so we can get you signed up. Home Brewers Tasting Tent opens to the public at 12 pm.